Fort Hardknox. Its world is fire. And blood. But mainly acrylic paint. And glue. 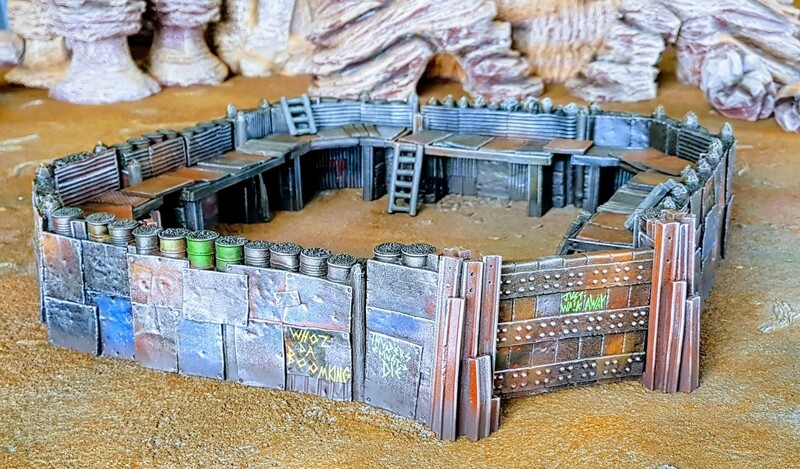 Fort Hardknox is a resin set of four walls, three corners and a hinged gate in a post-apocalyptic, beaten metal panel and scrap style. All of the walls and corners have a flat battlement floor piece, with a pair of small supporting walls. A number of ladders and small extra panels that can be used for whatever you want are supplied in the core set shown. I bought this pre-release copy of the set, because I was jealous of the three (!) of my buddies –Asslessman/Leadplague, Axiom/Magpie and Old Lead and Curis/Ninjabread – who were working on their copies. I was gravely disappointed. I had to unleash my dogs of war… or paints of war… or smegma painting crazies. Whatever, I’m going off topic. This was my favourite Mad Max movie for my whole life until, totally unexpectedly, that changed in 2015. But I still love Mad Max 2: The Road Warrior. And if you love Mad Max 2: The Road Warrior, then you love post apocalyptic scrap forts. That’s science. I had to have one. Come quietly, or there will be… trouble. 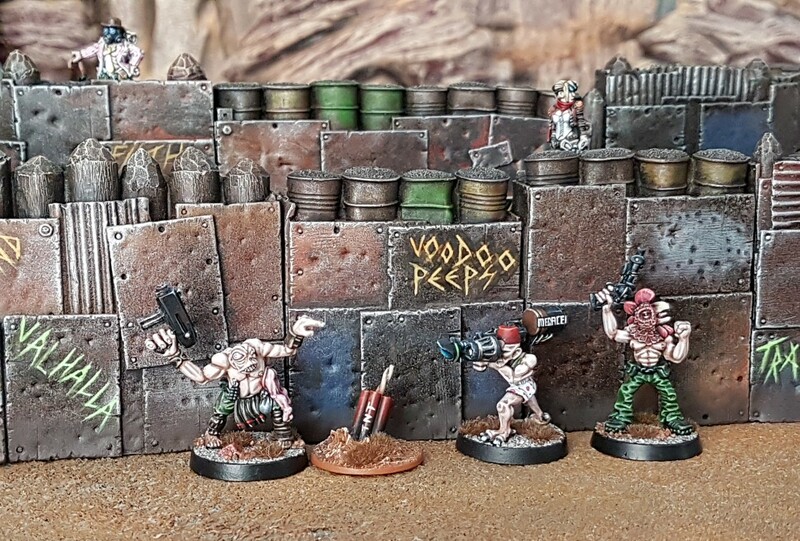 The other bloggers had their forts either nearly or already finished, and considering the standard already seen, I knew that a direct competition in terms of painting quality was doomed. So “Screw that!” as Sun Tzu would say, don’t engage if you cannot win. I did reckon however, that I had one chance for my fort to stand out in that company. I figured that I could get it painted pretty fast, like V8 faster than the other guys, based on a speedy technique that I have working on recently. If that worked, then I could at least publicly rub my friends noses in how long it took them to finish. “What a puny plan!” I hear you cry. Well “Nobody likes you, everybody hates you!”, as Sun Tzu probably also said. And anyway, as I type this, I have the benefit of hindsight, so I know that the plan worked, so it is you, dear reader, who should be feeling embarrassed now, not me. Hah! What do you think this is, some artificially dramatised home improvement show? Grand Designs or some crap? NEVER! they are moulded without release agent, therefore there is no requirement to degrease the models. A time and hassle saver. they have close to zero mould lines from what I can see. However Fogou does it, that aspect of clean up on a model set this size was essentially about one minute. Really. low component numbers. The only assembly required on this set was to glue the battlement floor pieces and two supporting walls to each of the main walls and corners. The absence of mould lines meant that those elements went together extremely easily. I glued them with some gel superglue in less than half an hour (maybe less, I didn’t time it). All of that meant that I easily had time to get the set out of the box to 100% ready for a black spray undercoat during a spare hour on a weeknight after work. Witness! 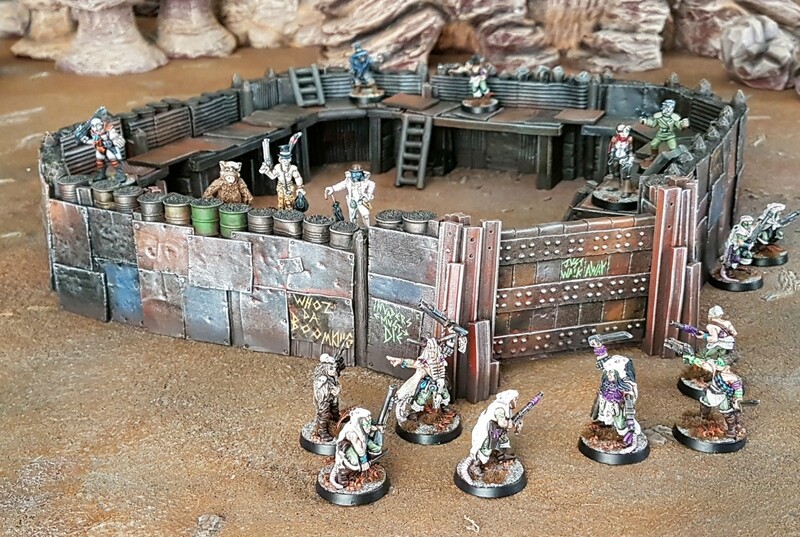 Lurking outside the settlement of “Standard Falls”, mutant insurgents stealthily attempt to breach the wall. The following Saturday morning was the riskiest part of the plan. Anyone who has endured a St Patricks Day parade in Ireland knows that March is not ideal for spraying models, it can go either way. Luckily Saturday turned out to be… a lovely day! Well, not all day, it cleared up a bit after lunch. At this point I contacted Curis at Ninjabread and we started a video chat that lasted until the early hours of Sunday. Curis was working in his fort. I was working on my fort. We each had colours and techniques worked out, so it was a pleasure to spend that Saturday chatting while painting, so much so that we did the same thing all day Sunday too. We were even joined by Captain Crooks/Funky Wenis Rodeo for some of the Sunday morning. Batch painting is a lot easier and more enjoyable with mates. I’m not great at it while painting something like a character model that requires more concentration, but for certain types of work it’s great. I imagine that its why sewing circles are so popular… apparently… well, that’s that what I heard. Rough blocking of coloured panels, the “Duplo Stage”. Orange Drybrushing on rusty areas. Drybrush the metal with Necron Compound. Reggie Beef Wellington surveys progress. Working on drybrushing brown on the bottom of the walls to “ground” the terrain a bit. Mushrööm Klöwd in da house. Graffiti, barrel variants, ballast colour. No! No more talk! We go in! We kill! Kill! We kill ’em! They kill us, we kill them! Kill ’em! Kill ’em! Kill! Kill! I dunno if it’s enough to get me to Valhalla, but it should keep the night fevers away until I get the other add-on elements of Fort Hardknox, as hinted at in this illustration by Doti at Katsina Miniatures. Maybe I’m just elderly but I couldn’t find it on the website? I got a pre-release copy, it’s going to be on Kickstarter soon. I got a pre-release set. It’s going on Kickstarter soon. The effort has been rewarded at least 5000% – and that’s just based on the MK rehearsal pic. 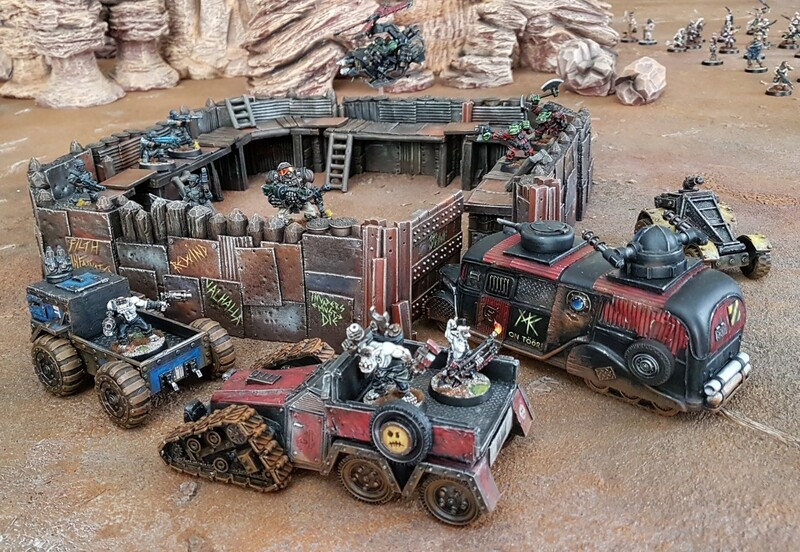 Bravo for smashing this huge terrain piece out to such a standard(falls) in such a short(en) time, you’ve set the bar! Now walk away! To the bar! You puppy! It was a MK gig that caused the apocalypse in the first place actually. It was a fun and satisfying challenge to get the fort painted to a pleasing level that fast, thanks for the feedback Captain! Gorgeous! Will need to give Fogou a look. You should Mikko. There are several tasty items there, including some beehive huts ripe for a-Star Wars-ing. That’s it I have to have one of these! Thanks for 80’sing up this post as well!!!! Fort Hardknox will fit in to any one of your tables I expect, knowing how you approach those things airbornegrove26, but I get a bit of a New Texas vibe from it. At least, it’s definitely going to feature in my Dracula’s America in Spaaace games. Nicely done! I really need to build more terrain. I’m in the middle of a vehicle binge, but vehicles need places to motorvate. Thanks for the feedback SP! Brilliant mate – the fort is awesome, (goes without saying really!! ), but it’s the cultural references that make me laugh & make your world such a cool place to hang. I really want to see MK take on Boss Drum! That’s very kind Alex, thanks. I did wake up this morning and have to check if I had actually just written a load of crap, but thankfully I had written a load of crap with a purpose. I have to be in the right frame of mind to blog, but when I am it just kinda pours out. Results are usually a bit of a ramble, and when I go back I can always see things that I would write differently etc, but I do try to make the posts at least partially worth reading. As for the models and terrain themselves, I can’t really imagine approaching them any other way really. 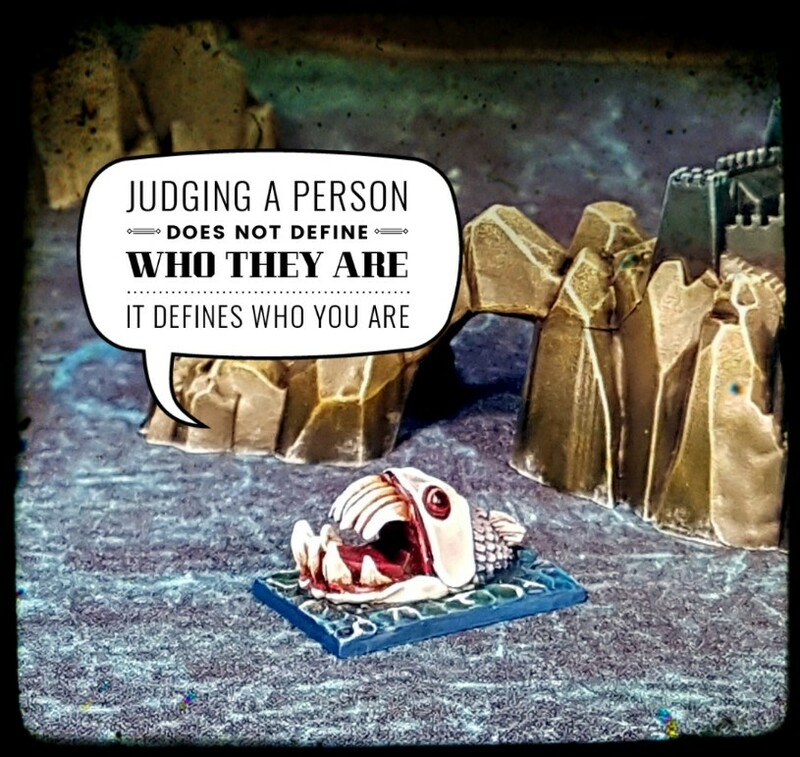 I’m deadly serious about the hobby – I’m obsessed – and I don’t treat 99% of my models as jokes, but that doesn’t mean that there isn’t humour in nearly all of them. Almost all of them are fundamentally absurd before I have taken them out of the packaging. Fantastic work and a great write up. I always enjoy reading your posts. Thanks Paul, I’m trying to work faster, not harder. I’m glad that you liked the results. Fantastic paint job on a wonderful set! The graffiti both personlises it and adds real character. The graffiti also adds a splash of colour here and there too, which can be fun. Hmmm, Good AND fast. You’ve broken the rules son. That’s super tasty. If I ever see it in person I might give it a wee lick. “IF”?! Are you using my Fort post to announce your retirement or something?! Of course you will see it. 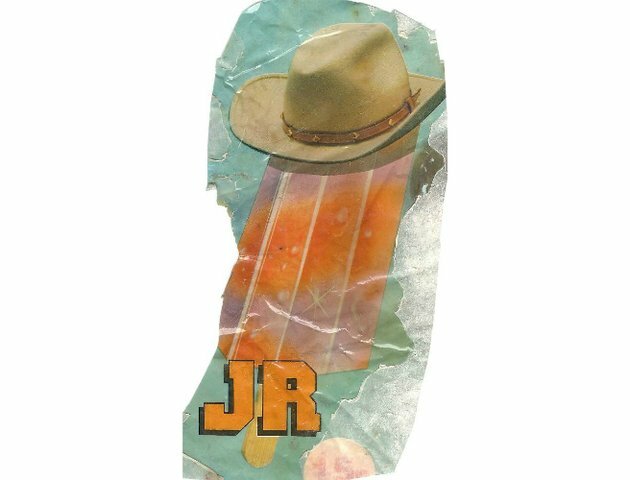 It tastes a lot like those “J.R.” ice pops from the eighties. I’ll stop one day, the same day my breathing ceases. I look forward to scaling the walls sneaky like/busting them in with a ram on a truck. I’ll pre-lick a bit for you, all special like. Woah, that is one badass fort. Someone needs to attack it! It’s not certain yet, but it looks like it might be human Resistance holding out against an unseemly number of T-800s for the Hardknox debut. Wow man, love this – and I always loved that movie too – in my top 5. Btw, is that ALF in there? It’s a fantastic movie, so influential and definitive that I don’t know if new viewers can appreciate what it looked like in the eighties.